Here’s some group guidelines and rates. 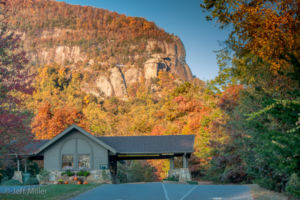 For a day of elevating experiences, bring your group to Chimney Rock at Chimney Rock State Park. We have everything it takes to give folks of all ages and groups of all sizes the best of the mountains in one place. We host a variety of groups including motorcoach groups, reunions, churches, car and motorcycle clubs, student groups and corporate outings, with activities and catering options to suit your needs. Save up to 20% with Our Group Rates. Chimney Rock makes it easy to bring your group for the day. Groups of 15 or more paying guests are eligible for group rates provided all admissions for the group are paid in a single transaction. *Group Rate discount is offered for groups of 15 or more paying guests provided one person purchases all admissions for the group in a single transaction at the Ticket Plaza. Reservations encouraged but not required. Group shuttle bus service is available by reservation only. There are no additional discounts taken off group rates. Book your group today. Call 828-625-4697 (ext. 1) or send us an email. The Park is a great spot for folks of all ages and all abilities. Head out on the moderate Hickory Nut Falls Trail leading to the bottom of 404′ Hickory Nut Falls. The Great Woodland Adventure Trail is perfect for families. 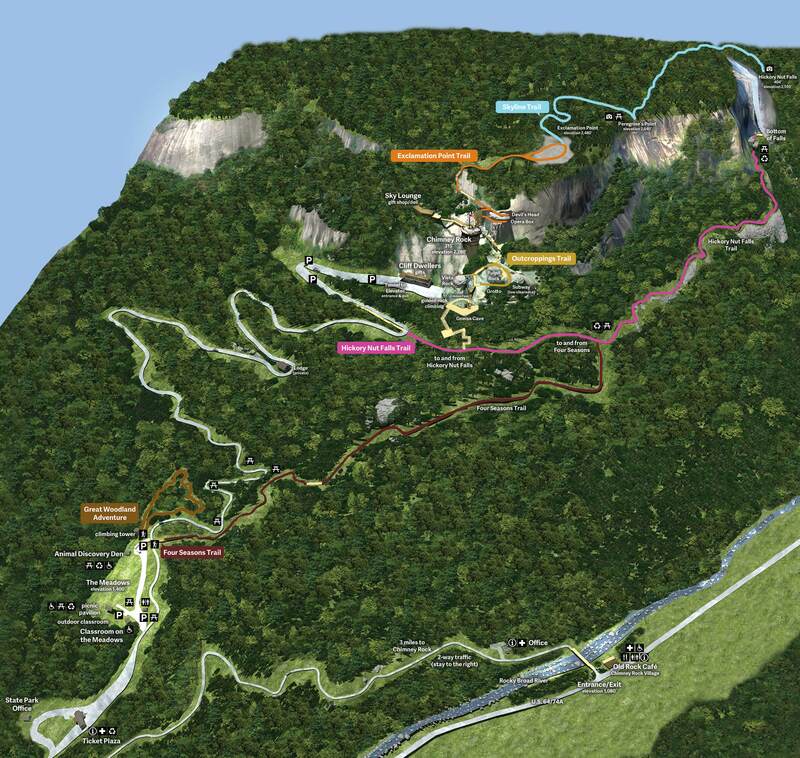 The Four Seasons Trail winds through hardwood forest and gains 400′ in elevation before it connects to the Hickory Nut Falls trail. Hike up to 20 people on the Skyline Trail with breathtaking views. One Naturalist can guide a hike of up to 25 people. The amount of time depends on which trail you choose. Pricing varies based on group size. 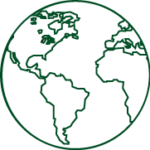 Choose from a variety of program topics, such as raptors, plants, geology and birding. We can tailor any program just for you. Bringing a Group of Kids? Join our team of naturalist for a fun-filled day at the Park. Learn about native plants, local wildlife and even meet some of our resident animal ambassadors during your visit. Find out more about our educational opportunities for your group. 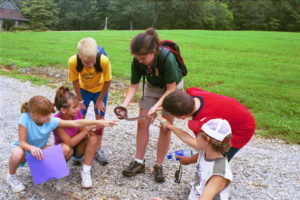 Divide your group into teams to hunt through the Park to find answers about the history, geology and trails. Specific questions can be designed to lead your group through certain areas of the Park most suitable for your outing. Cost: $25 per group. Prizes are available for an additional fee. Try our climbing tower overlooking the Hickory Nut Gorge. Ideal for guests of all ages. Develop new skills, learn to cooperate and build self-confidence. Call for pricing; advance registration required. 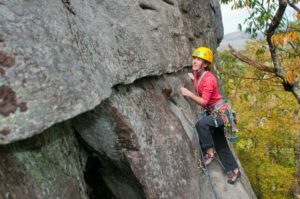 Our partners at Fox Mountain Guides offer a complete rock climbing guide service for all groups, family trips, reunions, birthday parties, school trips, church group excursions and scout climbing and rappelling trips as part of the Climbing Merit Badge, or as part of an extended trip anywhere in North Carolina. 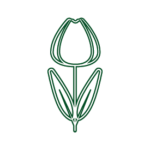 Discounted group rates start at a minimum booking of seven clients, and we offer a range of possibilities including full- and half-day bookings. Our featured dulcimer player, John Mason, is friendly, lighthearted and takes requests. Select some of our great souvenirs for your group: walking sticks, water bottles, magnets, DVDs and much more. Or, if you can’t decide, offer your group Chimney Rock Gift Certificates that can be redeemed at our gift shop, at the Old Rock Café or for an upgrade to a Chimney Rock Annual Pass. We offer a variety of spectacular settings for your special function — from a sunrise breakfast in the Park to an elegant party high above the Hickory Nut Gorge to a riverside lunch or dinner at the Old Rock Cafe in Chimney Rock Village. Let us do the work for you. Plenty of room to play! Our 5 acres of green fields are surrounded by mountains. Enjoy your meal indoors or on our deck overlooking the Rocky Broad River; we can accommodate 40 people inside plus 60 people on deck. 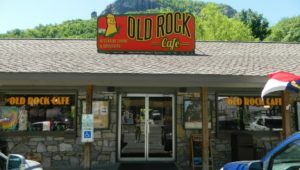 To reserve the Old Rock Café for a private function, a catering minimum may apply. The Old Rock Café can also cater to your group in the Meadows pavilion. Some restrictions apply. All food functions at the Park are served on-site by our staff. All catered food functions include tables, chairs, non-alcoholic beverages and tent/pavilion usage for two hours. All prices are per person and include tax and gratuity. Individual non-alcoholic drinks are included in your lunch and dinner price. Final food counts and payment are required 7 days prior to your event. Catered groups receive two complimentary hours of tent or pavilion usage. Additional rental fee may apply for longer use. Venues are accessible by all ages and abilities. Each of the catering venues has convenient access to restroom facilities and is wheelchair accessible. Pre-ticketed admission is available. These tickets will only be valid for your event date. For each ticket purchased, guests may upgrade to an adult Annual Pass or Kids Rockin’ Discovery Pass membership for youth (ages 5-15). Pay just $12 per adult or $5.50 per youth (ages 5-15) and get 12 months’ worth of fun. At Chimney Rock at Chimney Rock State Park, safety comes first in everything we do. Our Trails team monitors the trails and assist guests if needed. Every guest is asked to stay within our marked trails and public areas, and the rules of the trail are posted at each trailhead. 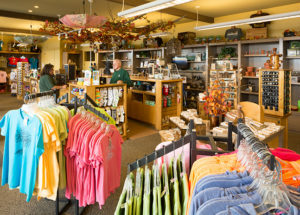 The Classroom on the Meadows, Cliff Dwellers Gifts, the picnic areas, all rest rooms, the elevator, the Sky Lounge Gift Shop & Deli and the Old Rock Café are all handicapped accessible. Pre-registration is required for motorcoach groups with handicap needs. All events at the Park will be scheduled and held rain or shine. Shelter is provided for all food functions. Should a weather event arise causing closure of the Park the group will be notified as soon as possible and issued a full refund. We’d love to help you plan your group outing to Chimney Rock. Please fill in the required fields and include your questions/comments.